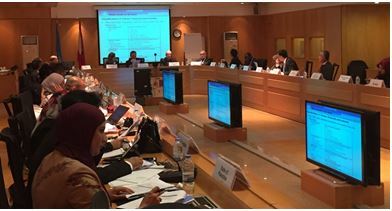 The workshop brought together 33 representatives from 17 National Statistical Offices (NSOs) and 8 experts from international organisations to exchange their experience and knowledge in the Islamic finance field. The overall objective of the workshop was to increase the capacity of participating countries on the statistical treatment of Islamic finance in the national accounts. The workshop addressed the proposals on how to sectorize Islamic financial institutions, classify and record Islamic financial instruments and the corresponding property income and related transactions; and calculate and record the output of Islamic financial services. Participants shared country practices in the compilation of statistics on Islamic finance and the challenges and issues involved. Experts from regional and international organizations and individual experts were invited to participate as resource persons. Mrs. Selçuk briefed the participants about the project on “Developing an Islamic Finance Industry Database for OIC Member Countries” which aims at forming an Islamic finance industry indicators framework and constructing a database. The project was introduced about its background, objectives, methodology, potential audience and impacts as well as preliminary results of the recently conducted survey designed for the project by SESRIC were shared specifically. The outcomes of the meeting will be submitted to the next meeting of the Advisory Expert Group Meeting on National Accounts which is to be held in December 2017 at UN headquarters in New York.